Firstly let me thank the hardy souls who turned up last night at the Groves. Because of the lack of numbers, they were unwilling to keep the place open, but never the less, they allowed us to dance until half eight. A particular apology goes out to Patricia, who turned up for the second class, only to find us packing up. I put the music back on and did two dances with her. After her battling through the snow, it was the least I could do. Sharon had left word she wanted us to practice the cross, but after an initial start, the numbers and levels attending made a class impractical. Of course there was also the problem that I had no lesson plan. Fortunately I did have my laptop and sound system with me. This caused it’s own problems: my laptop refused to respond to mouse strokes, even the arrows did not work at first, although they did respond later, enough for me to get the music going anyway. Typically, it was fine when I returned home, technology, where would we be without it? I believe Sharon was stuck somewhere on the A483 or A5, I hope she got home safely. I must also add a word about Pete Rogers. I joke about his singing, but he always gives a good night. It seems the act for Sunday night was worried about the snow, thankfully Pete stepped into the breach and kept us fully entertained all night. I think I can speak for everyone there, in offering our thanks. I am a bit pressed for time so I apologise for the short post, hopefully there will be time later to add more. This tradition thing is catching on; Mondays class was dedicated to learning how a Milonga works, and the traditional music. Sharon had a basic class at the beginning, where we learned a simple step that would allow the beginners to keep moving around the room. After this some time was spent on the etiquette. No overtaking, no walking across the floor, no back steps, and no stopping the flow, to teach a move that was not followed because you could not lead it. This is my favourite bug bear, if a woman does not follow what I have led, and asks what should I have done, I always respond “just follow” if she does not get it I will try again later, modifying my lead until she does. There is nothing worse than someone stopping the flow with both parties in a couple looking at the floor, trying to do something that is obviously beyond them. It is, ok, to just walk to the music. OK back off my soap box; We were arranged around the room, men one side and women the other, eye contact being the only form of request allowed. Again I must admit to walking up to one or two women to ask them to dance, as they were too busy talking to catch my eye. The music was kept traditional and arranged in tandas. I liked the choice of Aker Bilk as a cortina. Sharon has taken a few photographs and has promised to forward them to me, I in turn promise to post some of them here as soon as I have them. I cannot end without a note to say that all the women had made a special effort and were all beautiful, there was not one there that I would not have been proud to have on my arm. Una cosa mas, as they say in Buenos Aires, I would be glad to hear of anyone who would like a regular Milonga in the Chester Area. If I do organise anything it would have to be irregular, maybe once a month. My shift working prevents me doing something on a weekly basis, that is unless someone else comes in with me. 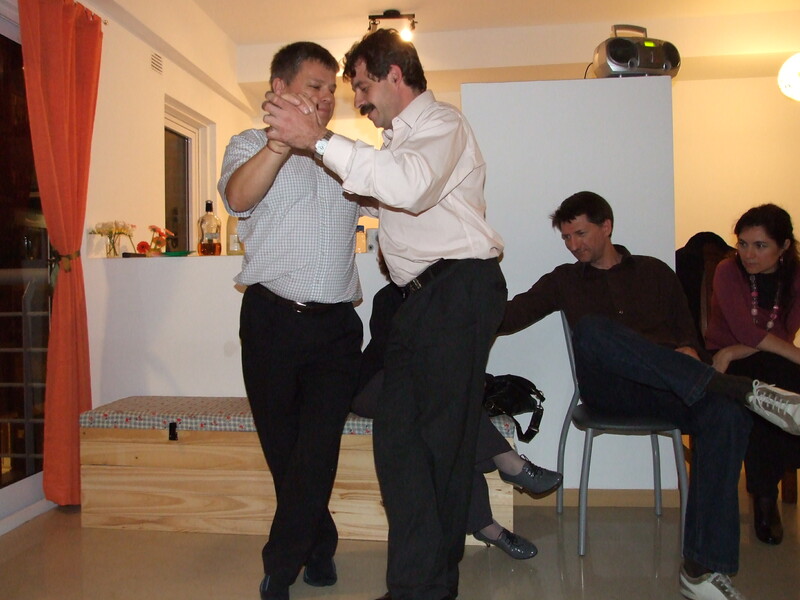 I think that the size of the crowd we have at present, a weekly Milonga would anyway be unsustainable, at the moment. But any ideas or offers are welcome, lets get something moving. I looks like I am to forever follow in the Chester class. Sharon wanted to do close embrace, usung the techniques from Sven’s Class, but there was a problem, nine men and only three women. Fortunately as the class continued a few more women arrived (unfortunately also some men). So when the men walked in a circle around the outside of the room, I joined the women in the centre. I have now been renamed Roberta for the sake of the class. Fortunately I am very hetrosexual, so that when it came to close embrace, it was well understood that there was nothing “gay” about this. It has to be thought of as a hug, like when you score a goal or it is somebody’s birthday. Perhaps because I was never, what they call a popular boy when in school, many years ago. I enjoy the fact that I now have some sort of popularity. At the end of the class one lady complained that she had danced with every man in the room except me. Now those who know me will tell you I am a shy retiring type, so that my first reaction was to say “Sharon music” I was over in a flash. I know I will never be one of the great milongueros, but I seem to have achieved a status amongst the beginners, and I have to say I love it. To the ladies who rush to dance with me I can only say thanks, this world gives me a joy and confidence that I have never had. There are men out there, I know who think that dancing is a bit gay, you look a bit of a puff, also many belive that it is just too dificult “I have two left feet”. Most of this is just excuses or lack of self conficence, The confidence will come, and after the first time you will wonder why you waited so long, I know I did. It took many years for me to gain any confidence, perhaps because of my early years, or maybe as some have said, a complete lack of coordination. If I can do it then anyone can, So what are you waiting for, come on join the dance. Next week is a Christmas affair, I am not sure what Sharon has in mind, but, if you are not there you won’t be able to join the fun. Last night (Monday) I was again at the groves, and again there were more men than women. This is a strange phenomenom, it seems to be happening more and more. While I am happy to follow in the class, I am afraid that the men will not dance with me in the practice, which means of course that there are not enough women to go round. While this is not usually a problem for me, I worry that it may eventually put some men off. Could this perhaps be why there are often more women in the intermediate classes? I do enjoy these practice sessions and am pleased to see more people from the beginners stopping for the late practica. I particularly enjoy the fact very beginners have not yet learned the steps and as such are still open to be led. Unfortunately I had to leave early as I was up at five and next week I have to work a night shift. So I hope to see you all there in a fortnight. Some advance warning, I will be taking the class on the 29th December. As yet I do not know what I will teach, I suspect I may concentrate on leading and following technique, but if anyone has something that they wish to concentrate on, please drop me a note or comment here. PS I have just realised that I will be there (The Groves) next Monday it is the following week that I must work. Just shows that even I have problems with my shift patern. For those watching for events, we will be at Northwich Memorial Hall on 22nd November, Ballroom and sequence with Goodtime Combo. we will be booking two tables, and already we have fourteen names. If you wish to join us drop my a line we can always book more tables, just pay on the night. On the Tango scene I will be at the Groves tonight probably being a leader for the absolute beginners. It is strange that in Tango for the absolute beginners ther always seem to be more leaders, yet any higher levels and ther are never enough. I have heard many theories on this, mainly women saying that men neverstick at anything, I would love to hear yours. 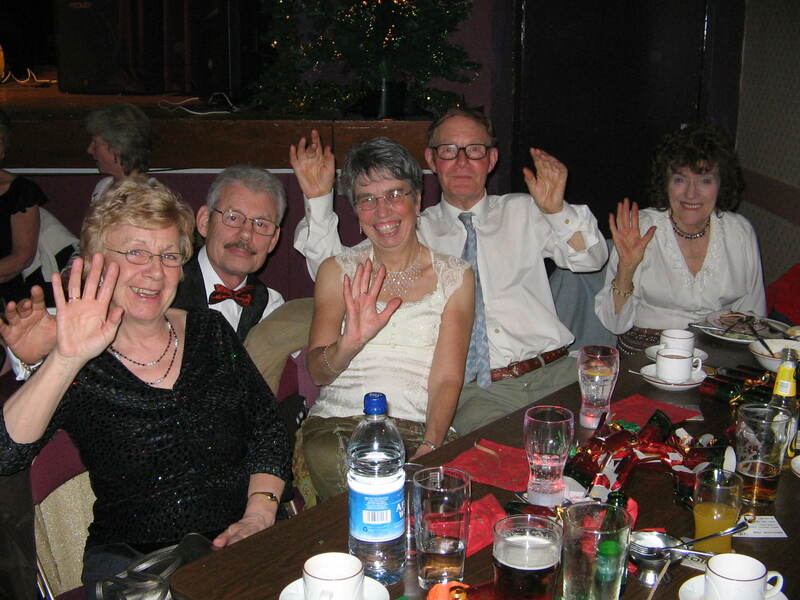 We danced our hearts out last night in Connah’s Quay Navy club, a guy on the accordian called Eric Reid from Stoke. He was really lively and never gave us a moment to rest. The floor which is usually awful seemed much better maybe someone is listening. Anyway I am off now until Sunday so watch out for reports of our activities.